The dead included four constables, one havildar, one police driver and a security guard. The inspector general (Operations), MS Bhatia, said that the injured have been taken to Daltonganj from where they’ll be taken to Ranchi. Hussainabad police station officer-in-charge Rajesh Prasad Rajak, who was leading the party, had a miraculous escape as the IED exploded seconds after his vehicle had crossed the spot, but the security personnel following him in another vehicle were not as lucky. 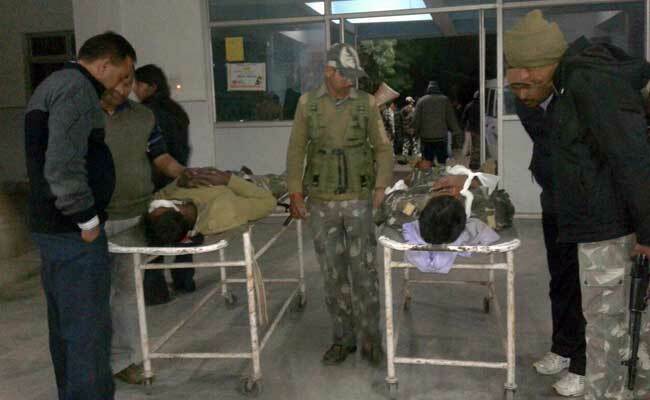 CRPF inspector general RK Mishra had earlier confirmed the death of two police personnel. “Two police personnel including the driver of the vehicle have been killed and eight have been injured,”said Mishra. He added that reinforcement had been rushed to the spot and the senior police officers were monitoring the rescue operations. Confirming the incident, Jharkhand police spokesperson SN Pradhan said prompt action would be taken against the perpetrators of the ambush attack. Rayagada, Jan 27: When the Government administration was busy in the preparation for Republic Day in Rayagada district and block headquarters, there was ultra-left activities going on in Kalayan Singhpur and Bissam Cuttack blocks. Several cadres of the Naxals outfit barged into village named Daliakuji in Hatamuniguda Gram Panchayat under Muniguda police station during last Monday at around 3.30 AM and torched a JCB and a tractor engaged for construction of a road under Pradhan Mantri Grama Sadak Yojana(PMGSY). After setting the vehicles to fire, the red rebels fled into the nearby jungle. They also pasted a few posters and a banner at Dhepaguda Chowk. 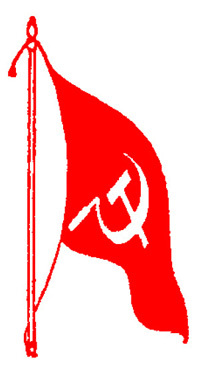 The Maoists have put banners and posters in Parsali village, which is inhabited by the most primitive tribal group called Dangaria Kandhas. The district administration was successful in connecting this village, which is also a prominent panchayat under Niyamagiri Hill Range, with electricity and bus service after sixty six years of independence. The Maoists have given call to the local tribal to constitute Niyamagiri Brigade in all the villages to assert their identity and sustain their movement against Vedanta Company. The Naveen Govt has applied new strategies in suppressing the democratic struggle of the people by deploying police force around Niyamagiri Hills. Dialogue will not work, rights have to be snatched, mentioned the posters. They have requested the public to observe this fake Republic Day as a black day. As the police with bomb diffusing team did not arrive the spot till the report was written, the local commuters faced difficulties as the road was not cleared. Upon inquiry, the police said that they were going to have the combing operation soon with their anti-bomb squad. Locals are going through a sheer fear psychosis. In what is seen as a revenge killing, armed guerrillas of banned outfit CPI(Maoists) gunned down a junior cop Girija Paswan in Aurangabad district. The Maoists claimed that the 35-year-old Paswan was shot dead precisely because he had turned into a police informer and was suspected to have told his superiors about the whereabouts of Rajiv alias Bihari, a Maoist leader. Rajiv and his accomplices were killed by the Aurangabad police earlier this month. To protest the killing of four of their colleagues in Band-Goriya village in Aurangabad, the CPI(Maoists) had given a 24-hour bandh call from the midnight of January 25. The banned outfit had made an appeal to the fellow Maoists in neighbouring Jharkhand also to observe bandh. The bandh will remain in force till midnight of January 26. “Those killed by the police are martyrs. Their death will not go in vain,” the spokesperson of the Maoists said, adding that the Nitish regime, after coming to power in November 2015, has extended its support to ‘Operation Green-hunt’ following which the police have launched a crackdown on the Maoists. In view of the bandh call, the Bihar Police in general and the Aurangabad police in particular have beefed up security measures. Aurangabad SP Babu Ram has asked cops to be extra vigilant during the bandh period and foil the design of ultras. In the past, the Maoists have targeted buses and trucks plying on National Highway or disrupted train movement on Howrah-Mughalsarai section, during their bandh call. Report by Badal Tah, Rayagada: When the Government administration was busy in the preparation for Republic Day in Rayagada district and block headquarters, there was ultra-left activities going on in Kalayan Singhpur and Bissam Cuttack blocks. Several cadres of the Naxal outfit barged into village named Daliakuji in Hatamuniguda GP under Muniguda police station during last Monday at around 3.30 AM and torched a JCB and a tractor engaged for construction of a road under Pradhan Mantri Grama Sadak Yojana(PMGSY). After setting the vehicles to fire, the red rebels fled into the nearby jungle. They also pasted a few posters and a banner at Dhepaguda Chowk. Similarly the Maoists have put banners and posters in Parsali village, which is inhabited by the most primitive tribal group called Dangaria Kandhas. Interestingly, the district administration was successful in connecting this village, which is also a prominent panchayat under Niyamagiri Hill Range, with electricity and bus service after sixty six years of independence. As the police with bomb diffusing team did not arrive the spot till the report was written, the local commuters faced difficulties as the road was not cleared. Upon enquiry, the police said that they were going to have the combing operation soon with their anti-bomb squad. Locals are going through a sheer fear psychosis. One Central Reserve Police Force (CRPF) jawan was injured in an IED (Improvised Explosive Devise) explosion in Maoist insurgency-hit Dantewada district of South Chhattisgarh on Saturday. “Janaradan Sonawane, a jawan of CRPF’s 111 battalion, was injured when a pressure IED (planted by Maoists) exploded near Sameli village of Dantewada at around 10 am today. The injured jawan was a part of a team which was out to provide security for the construction of a road in the area,” Mr.Dinesh Pratap Upadhyay, the Deputy Inspector General (DIG) of CRPF Dantewada range told The Hindu. “His right foot is gone and there are severe injuries on his left leg,” added Mr.Upadhyay. The injured jawan is likely to be airlifted to Raipur for treatment. Maoist rebels killed a former Sarpanch of Harni panchayat in the district today by accusing him of being a police informer. Police said here that extremists of outlawed CPI (Maoist) slit open the throat of former Sarpanch, Dinesh Tanti resulting in his on the spot death. The headless body of Tanti was recovered from the ‘jungle’ of Panchbhur. Sources said that extremists of outlawed CPI (Maoist) had kidnapped the former Sarpanch from Tarakant village in the district. Family members of Tanti had lodged an FIR in this connection last night itself and police had launched a search operation to find out his whereabouts. Naxalites had also left a leaflet at the spot, accusing former Sarpanch of being a police informer. His motorcycle was also found there. Police have launched a massive manhunt to nab culprits.